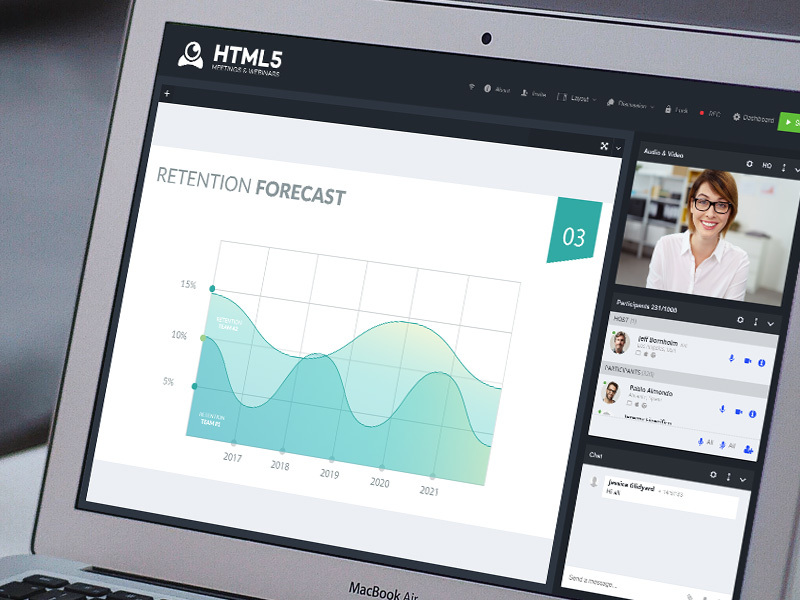 Our extensive platform HTML5Meeting is based on our engine ArchieBot, but it is designed and developed especially for meetings and webinars. The platform for real time communication works without any software installations, downloads and plugins, because it uses the latest WebRTC protocol, which is natively supported by most browsers. All you need to have is a browser and a smart device and you can organize and participate in real time meetings and webinars with a single click. It’s giving a variety of features – from high quality audio and video to extensive surveys, screen sharing and many more. This is the solution that can save the companies time and money. In addition, it improves the communication between members of teams spread across different cities and countries and helps in communication with customers. HTML5Meeting is a platform, that can be applied not only for meetings and webinars, but also for training in real time, due to its specially developed functionalities for dividing the participants into groups. The platform is built on the highest security standards to provide a fully encrypted and data isolated service. This makes it the preferred solution for big corporate companies, where security in communication is extremely important.